"I've always loved going out for quesadillas. Then one day I came up with a recipe for making them in my oven. They cook in about 10 minutes." 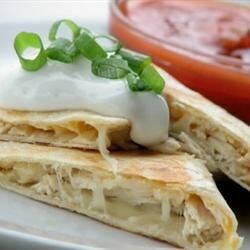 In a bowl, combine chicken, onion, mozzarella and cheddar; set aside. Spray one side of each tortilla with nonstick cooking spray. Place tortilla greased side down on hot griddle. Place chicken on half of each tortilla. Fold over and cook over low for 1-2 minutes on each side of until tortilla is golden brown. Cut into wedges. Serve with dressing. I added salsa and a bit of cream of chicken. Overall tasted just like the restaurant style. I'd def make again. Love, love love! Made these 3 days in a row! Gonna make them with pepper jack cheese next. YUM!